Jeff Walton is a US Navy Vietnam veteran and retired US Naval Criminal Investigative Service (NCIS) special agent who spent over thirty-four years in law enforcement and national security work. Final Departure is the result of Walton’s seven-year quest for answers about the Christian faith and the afterlife. In his Christian fiction work, Walton projects some of his career experiences and personal struggles on to the protagonist, Dan Lucas. Although the book is fiction, the heart of the story is an updated overview of Christian defense material. Final Departure gives the reader a twisting tale of life, death, betrayal and love while presenting a no-nonsense examination of the Christian faith. The seasoned national security expert asks: Is the Bible really true? What proof is there that Jesus Christ is the Son of God who came to earth in human form? Why is faith receding in America? How has modern science actually helped make the case for a creator? Walton realizes that faith is a deeply personal matter. His goal is to present the findings of subject matter experts in an entertaining, down-to-earth way that allows readers to judge for themselves. The book should be of special interest to anyone who is not sure if there is a God. 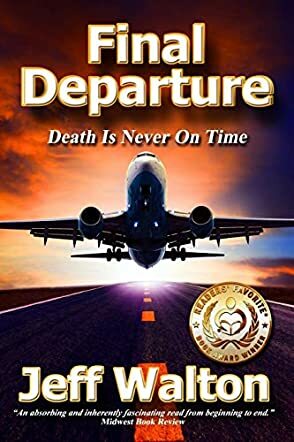 Final Departure (Death is Never on Time) by Jeff Walton is a Christian fiction novel that would appeal most to a predominantly Christian audience made up of young adults and adults. Dan Lucas is a retired NCIS Special Agent who is heading home to his family after a month-long stay in Germany, only for the Charlotte Douglas Airport to cancel all flights due to the hazardous weather conditions. Dan Lucas was only planning to rest and wait out his time at the airport until the new flight, but instead of resting, he finds himself pulled into a religious debate with an atheist known as Professor Ben Chernick. Will Dan be able to convince Ben that God exists or will Ben destroy Dan’s faith? Final Departure (Death is Never on Time) by Jeff Walton was an interesting book because it focused on the old argument of whether or not God exists, but it did so within a fictional story. I really liked the fact that Dan used to be a NCIS Agent because his old profession provided him with the skills to form well-reasoned arguments that presented in a persuasive and understandable manner. I normally avoid books that argue over God’s existence because they tend to rehash the same arguments in a dry manner; this book was the very opposite of that as it made me feel involved in the arguments and the story kept me interested in the outcome. Overall, I really enjoyed this book and my only complaint is that it was not longer!